You did so much crafting this holiday season. 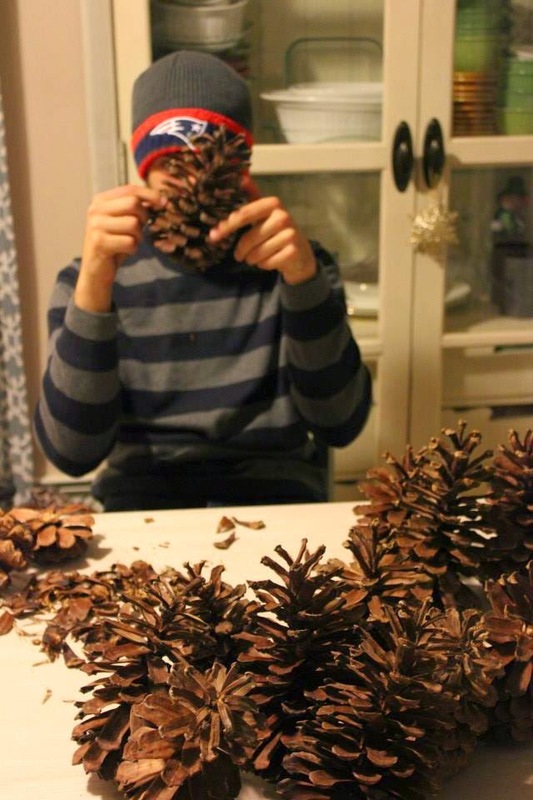 We made six shell heart frames & tons of Christmas tree pinecones. You were so excited to craft together in November, but when I told you we were finally finishing our last crafts in mid December, a look of relief spread over your face. You were ready for some Christmas movie down time. The idea for the Christmas tree pinecones actually came a year ago. We went for a walk in a park in North Carolina & found giant pinecones littered everywhere across the park grounds. 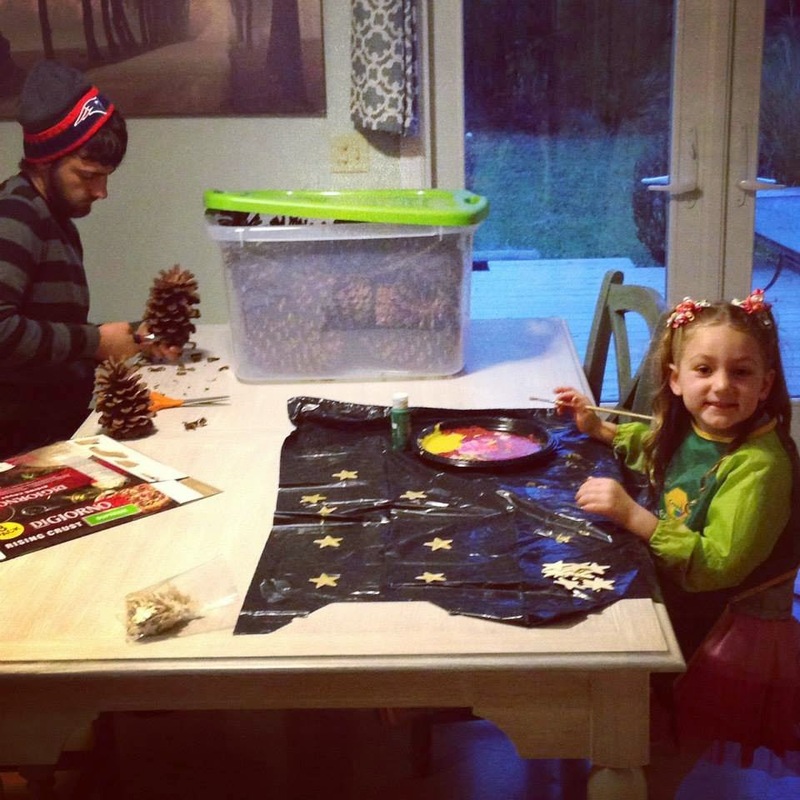 I remarked how much they reminded me of pinecones from the Redwood Forest in California & how they would be great to use in making Christmas crafts (which is probably because we had just made these). Your Nonnie agreed, & so the three of us spent the rest of our walk at the park collecting pinecones. We tried to pick large, straight ones. There were so many to choose from, & we ended up returning home with a big bag full. That bag sat in our basement until a couple months ago. Not knowing exactly what kind of Christmas craft to make, I turned to Pinterest. 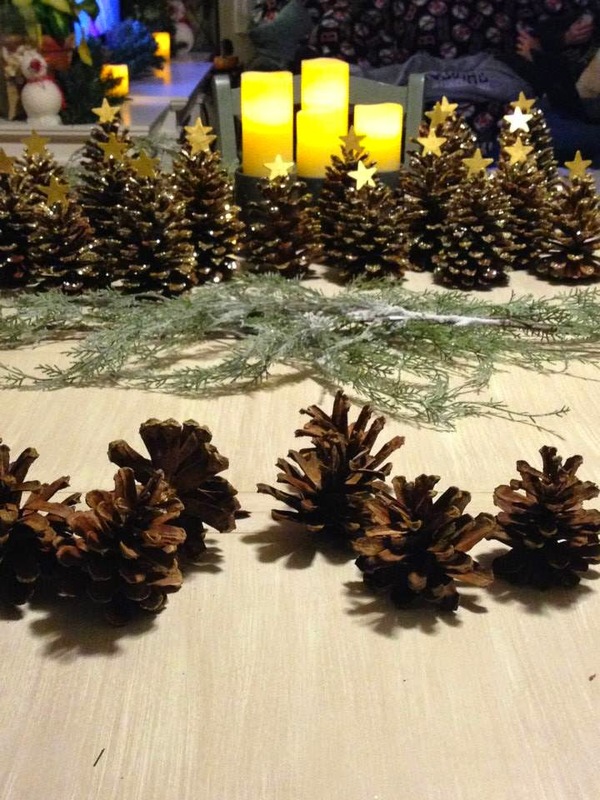 If you type in "Christmas pinecone crafts," you will find endless ideas. I pinned a few ideas that would work with the giant pinecones we had & then asked you which idea you liked best. You chose to make glittery Christmas trees with a gold star on top. 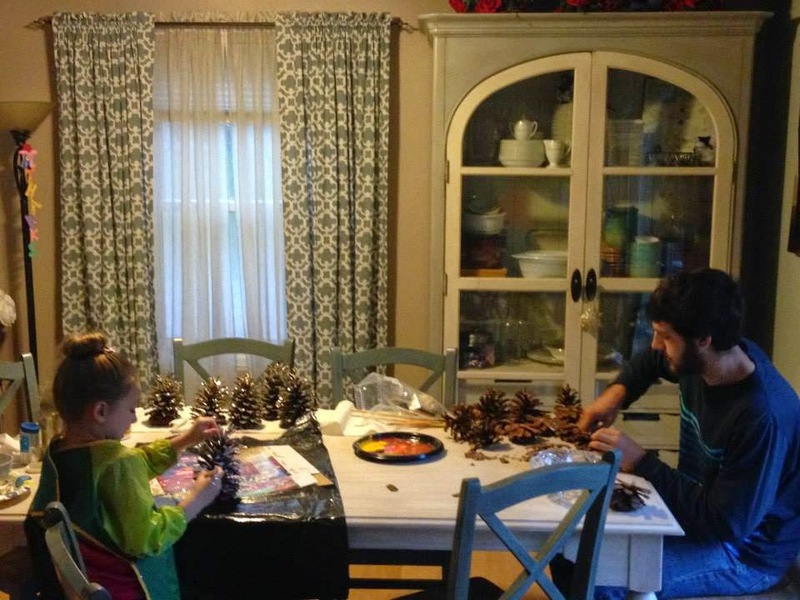 While you painted the stars gold, we enlisted your uncle Jared's help with the pinecones. Some of them were crooked, & he trimmed the bottoms a little so the pinecones would stand a little straighter. Note to self, teenage boys (& maybe most males) do not enjoy making Christmas crafts like you & I do. Jared pretty much hated me 90% of the time I enlisted him to help out with our craft. Sorry, Jared. While you painted the stars independently, you & I glittered the trees together. 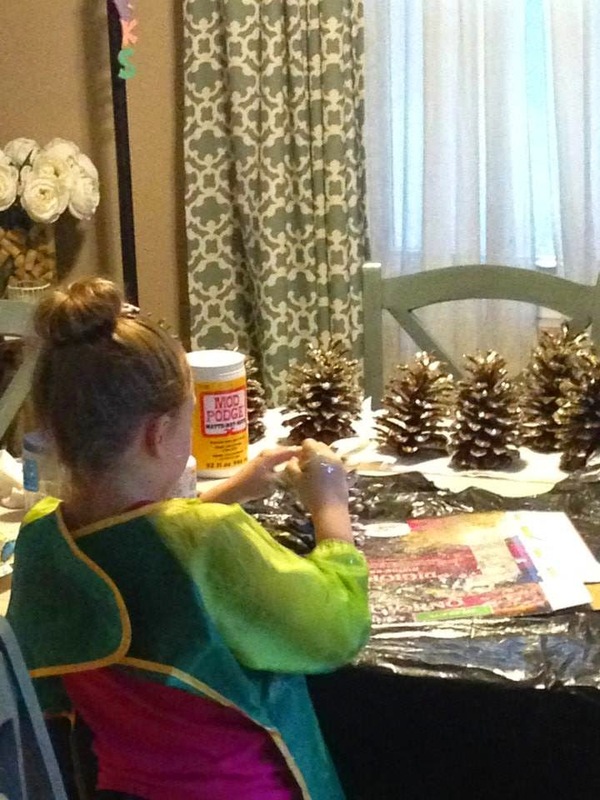 Using paint brushes, we generously covered the pinecones in Mod Podge, trying to get every crevice (we probably could have used spray Mod Podge & it would have been easier but then you wouldn't have been able to help as much). Once our pinecone was covered in sticky Mod Podge, we generously sprinkled a mix of gold & silver glitter (creating a champagne glitter look) all over the pinecone. 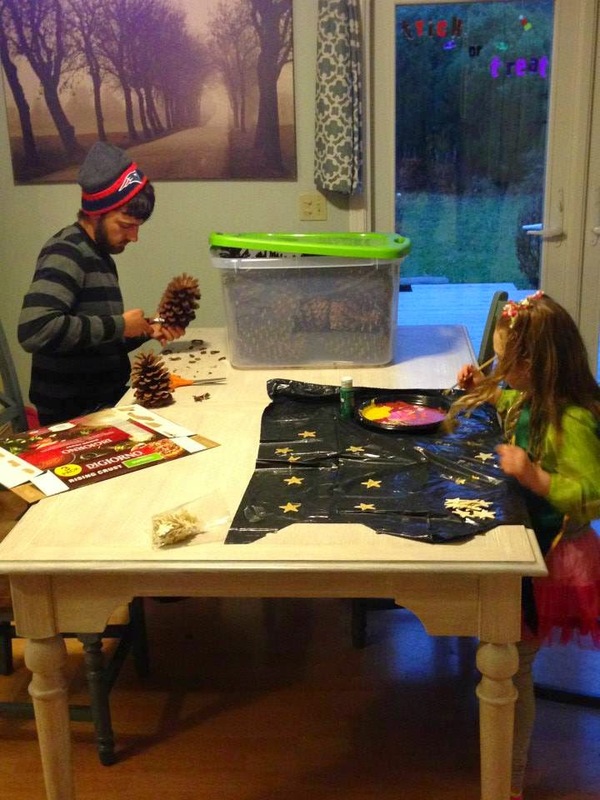 Later, I sprayed Mod Podge thoroughly all over the pinecones to seal the glitter onto the pinecones. 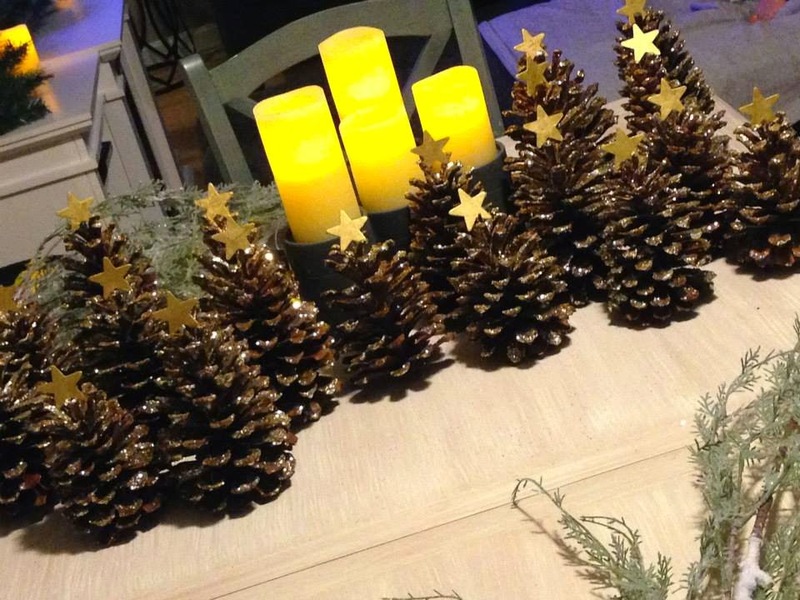 After they all dried, I used a glue gun to fasten the gold stars to to the top of the pinecones. You & I both loved how they turned out. 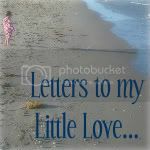 I mean, when you take an adventure at the park & add Mod Podge & glitter (it's still all over the house, poor Daddy), what's not to love? I think our "trees" are such fun holiday gifts for some of the special people in our lives. I love them so much, we took a bunch for our home (since we made more than twenty, we were able to keep some for ourselves & still gift them to many of our friends & family & your teachers). I love the natural & festive elements they bring to our holiday decor. Looking at them & knowing that my almost five year old & I (& Uncle Jared, sorry Jared) made them together...I think they are going to make me smile for years to come.